4 predelays injecting into 2 nicely geared delay lines, two complete resonant filters, distortion and high shelf. Remember, a delay is an echoing device. You really should prepare your sound to travel through space along with the OhmBoyz. This delay does not "click". Who wants a resonant filter ? high pass, low pass, band notch, wah-wah, adjustable bandwidth and resonance from -24dB to +24dB : enough to deafen to death your most respectable neighbours. A high-shelf filter, to shunt the highest sounds, useful after heavy distortion. Move several buttons in one move, with group selection and side-click. 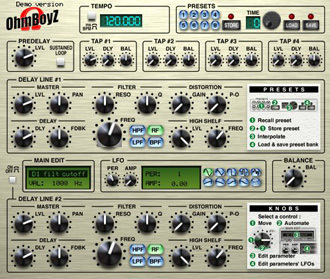 Instant result : with many sequencers (cubase, Orion...), OhmBoyZ adjusts itself to the right tempo and follows any occurring change. Useful presets, loadable on-the-fly, that can be applied instantly or with long or very long transitions where all the parameters switch from the old value to the new one in a ballet you won't forget. Five effects for the price of one : delays, resonant filter, distortion, high shelf ... Use what you want or need. All those effects, together, provides an unusual result : OhmBoyZ. Windows:minimum supported OS is XP. PSP 608 MultiDelay made it to our Top 7 Delay VST Plugin List!